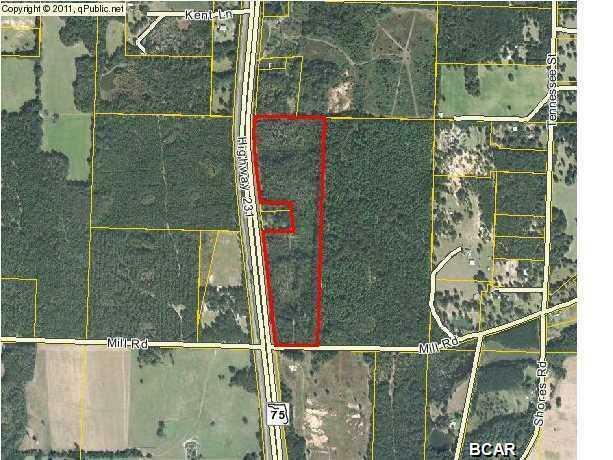 000 231 Highway, Alford, MLS# 750064: ERA American Real Estate Northwest Florida Real Estate Agent Property For Sale, Schedule a Showing, Call Brandon Jordan of ERA American Real Estate Today! This is an excellent commercial development site on Highway 231. 33 acres is perfect for development with nearly a half mile of HWY frontage. Many Business Opportunities such as: Convenience Store, Fast Food or Restaurant, Warehouse, retail space.... Please note: Location is the key as this parcel is 7 miles from Interstate 10 (the most widely traveled Highway in Northwest Florida), 28 miles from the Airport in Bay County, only 36 miles to Panama City, 45 miles to The World`s Most BEAUTIFUL Beaches, and one mile to Alford City Limits. Great deal for Investors and Developers! All information is collected from public record. Please verify with Jackson County Planning Commission. Survey, Site Development Feasibility Study available upon request.